If you follow me on Instagram you may be wondering what happened to this jacket, if I had set it on fire the way I had threatened many times. I did not destroy it, despite many problems during construction I did finish it, just before I went on vacation. I had hoped to take some stunning photos with it at Niagara Falls (you can see it was a part of my capsule wardrobe) but...it was too hot! I had expected at least one day of rainy weather, but we were blessed with sunshine and warm temps the whole time. But this past week we were finally hit with some rain at home, so I was able to give it a proper test run. 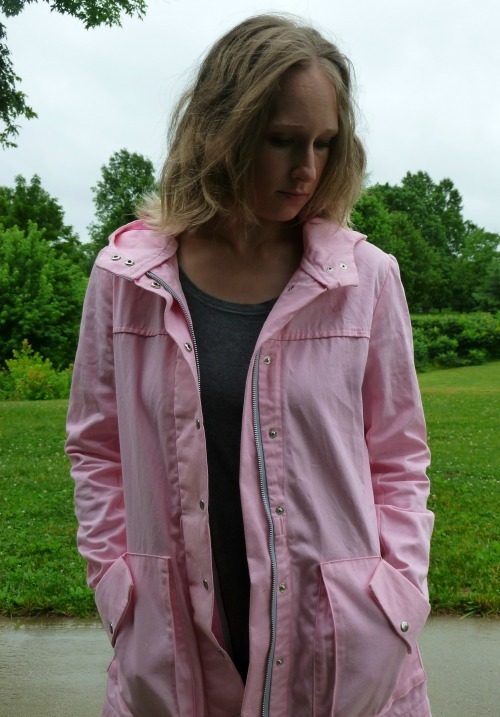 In case you didn't know, this is the Kelly Anorak by Closet Case Patterns. 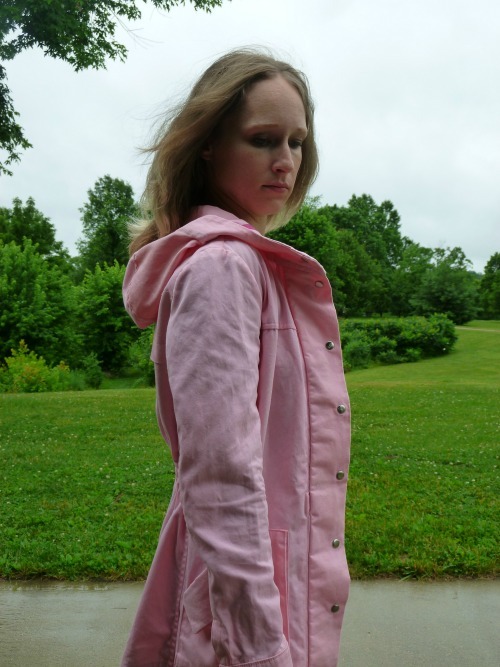 It is an unlined jacket featuring bellows patch pockets, snap and zipper closure, cuffs with snaps, and an optional hood. Waistline elastic with a drawstring is also optional. I went with the hood, and added elastic only on the back of the jacket. I hate drawstrings so I left that off. Sizing is from 0-20. I always get intimidated by jacket patterns that include such a wide range. 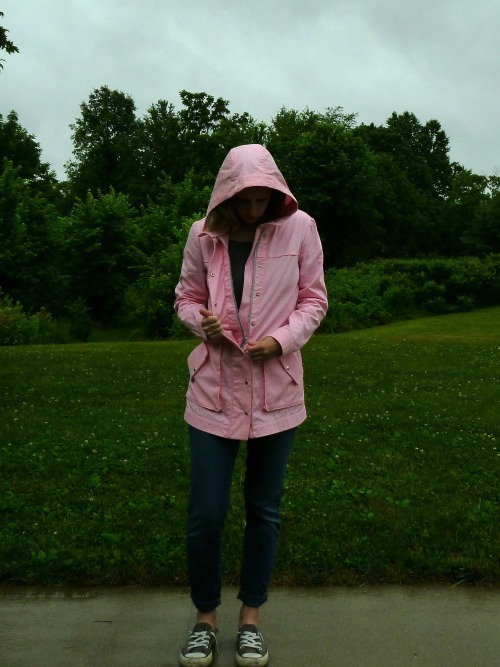 Often, shopping for RTW jackets is as "simple" as choosing Small, Medium, or Large, so to me, it feels weird to break the sizing down into such narrow increments. My whole life, I've been a small, but my measurements (34-29-38) put me at a 6-10-10 (clearly a medium, right?). After a (delusional) muslin of a straight 6, I ended up cutting a 6 for the sleeves, bust, and length, but grading out to a 10 in the hips. Sizing is pretty spot on, if you follow the chart and get over any hang ups about what the numbers "mean". 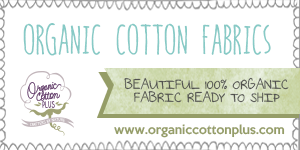 The fabric I chose is cotton twill from Organic Cotton Plus (sent to me for free in exchange for a review, affiliate link). I used another color way previously to make a Victoria Blazer, so I knew the quality would be amazing. I was not disappointed, of all the issues I had the fabric was never a problem. It behaved beautifully. 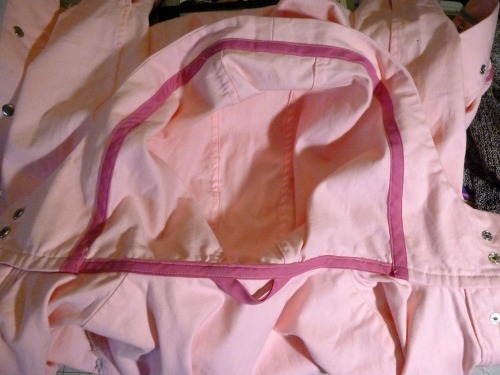 I've even used the scraps from before to line my Portside Duffle. This is a versatile fabric that would also work great for pants. 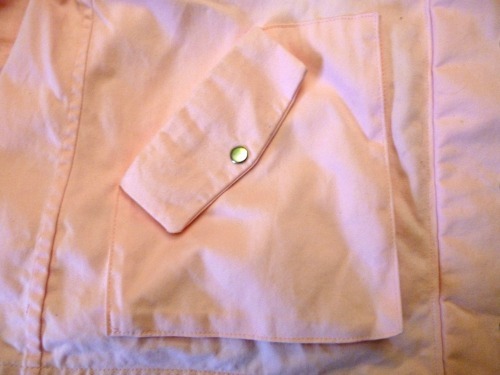 The pink is a bit see-through, in that I can see my dark clothing through it, but it's not like I'd use twill for a shirt anyway! Just keep that in mind if it's something that might bother you. So what were the problems you ask? In the directions and online tutorial for the zipper, the pull is on the right-hand size of the zipper (when looking at it while it is facing up). My zipper, purchased from a supplier on Amazon, has the zipper pull on the opposite side. 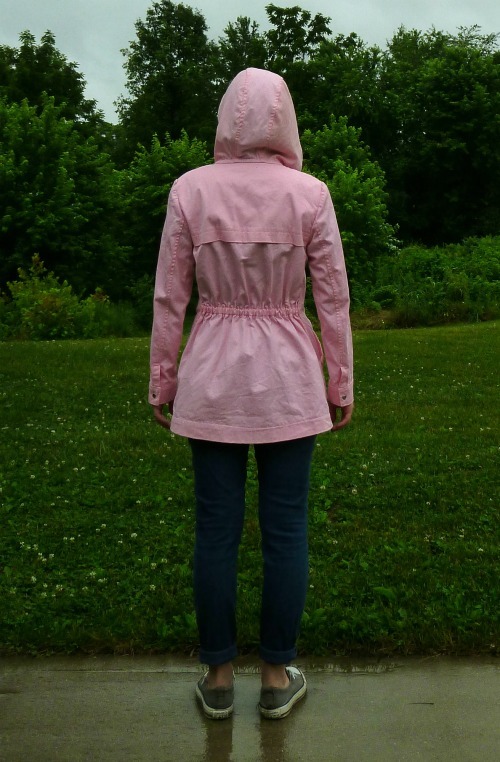 I'm not the first blogger to say she had trouble with this step, and in my case it meant I ended up completely unpicking topstitching and the facing on one side of my zipper because I put it in backwards. Aside from all these problems with the pattern itself, stupid little things kept happening. I waited two weeks for a zipper from Pacific Trimming, which ended up being out of stock, yet nobody called to tell me so. I had to contact the store, was treated very poorly, and left with no option other than canceling the order. I ordered a new zipper from ZipperStop via Amazon and was sent the wrong size (they, however, responded quickly to my issue and sent me a new one ASAP). I started off with Coats & Clark thread because it saved me a trip to Jo-Ann's, but the thread sucked and caused me to need to recut a piece. My denim needle didn't work well and I ended up needing a topstitching one for all construction. I didn't have enough interfacing (see above) and used some older stuff I had on hand, which wasn't ideal. I finished my first bellows pocket and immediately got black ink on it. Given all of the above, this was a super tough sew for me. Sewing is supposed to be fun. I'm not saying it has to be easy, but when you pay $20+ for a pattern you expect that it will not waste your time. Honestly, I can't recommend this pattern, and I'm pretty put off from anything else from Closet Case Patterns. I previously had a rough go of it with the Bombshell Swimsuit and I just don't feel like dealing with these designs any longer. PHEW. With that off my chest...here are the rest of the details. I finished as many seams as possible with flat-felled seams. 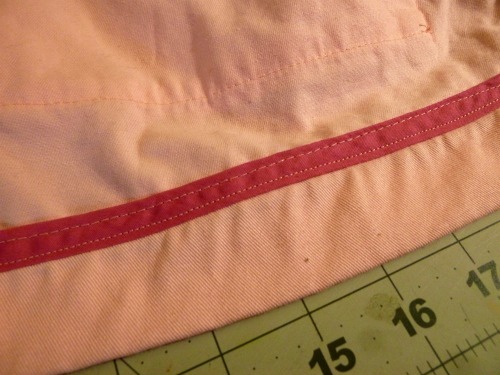 In some places, I used bias tape to finish instead, and I used the same finish on the hem. I love the way the bright pink pops along the hood seams. I also added a bias tape loop for hanging. 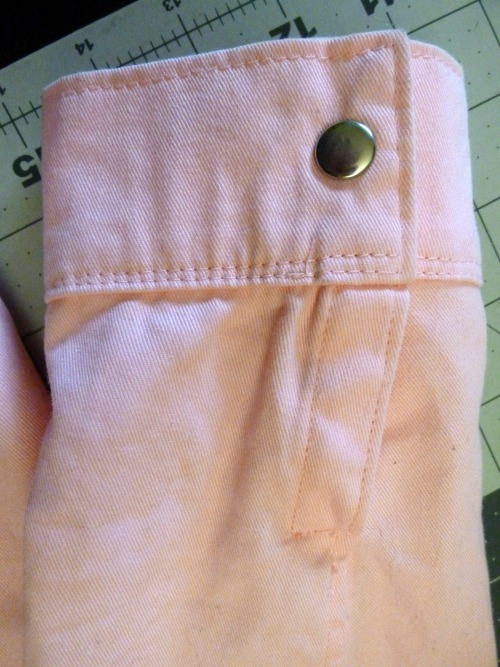 The snaps are 12mm "spring button snaps" in silver, to match the zipper. To set the snaps, I also ordered a snap setter kit. CCP has a tutorial on her blog. I've worked with a large variety of snaps, and different methods for setting, and these were by far some of the easiest. I still needed to be precise and careful, and setting 13 pairs of snaps was very time-consuming, but I'd rather work with these again over, say, sewing them in by hand! The one thing that would have made it easier is a fabric punch. I had to use an awl and it wasn't making large enough holes for inserting the snap prongs. 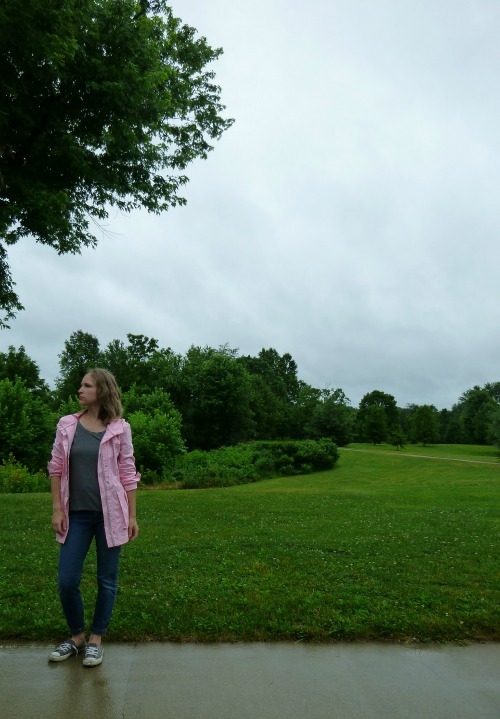 My husband poked fun at me for making a jacket in May/June rather than earlier in the spring, but it was actually a good thing. I finished it, set it aside, and tried to forget all our troubles together. I don't have any jackets like this in my closet and I know I'll wear it a lot. 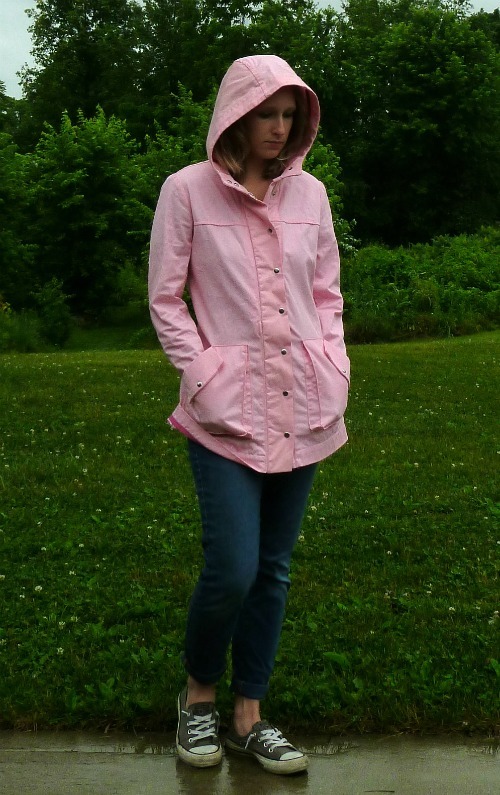 It worked well in the rain and the hood was nice and roomy. There is a small chance I would make another one, but let's be honest, "oh pretty!" will strike at some point with another pattern. 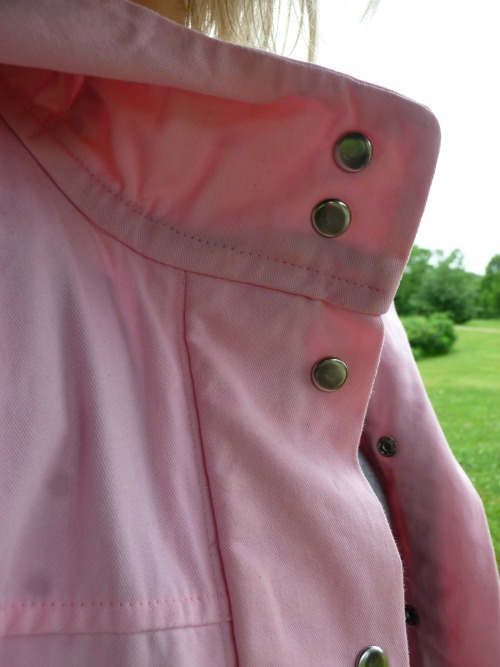 One last note...I did purchase some Otter Wax to use with this jacket, but it will be getting its own post later! 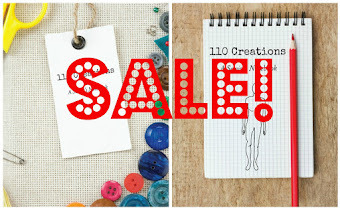 Awesome sale on A Sewist's Notebook right now! Save 10% AND free shipping! Use code BOOKSHIP17 at checkout. Ends tonight! Is there anything more satisfying than using up large scraps, AND finding a TNT all at the same time? 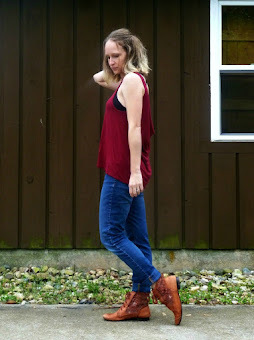 A few months ago I made a Love Notions Laundry Day Tee (free code in the Facebook group!) and ended up wearing it a ton. I decided to try the tank version, since I knew it would give me extra volume around the waist and hide my belly. I did think that my tshirt was a bit large, so I sized down for the tank, to an XS, and I love the way it looks! I love it so much I made two. 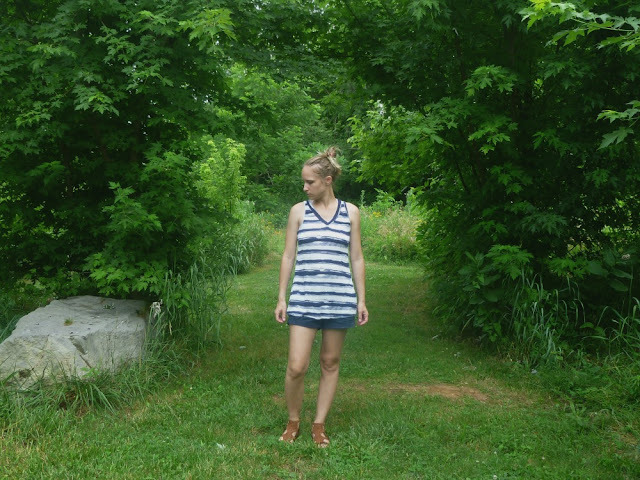 The LDT works best in lightweight, drapey knits like rayon jersey, which is what both of these are. The white (from Urban Rag Trader on Etsy) was previously used for, you guessed it, my Laundry Day Tee! 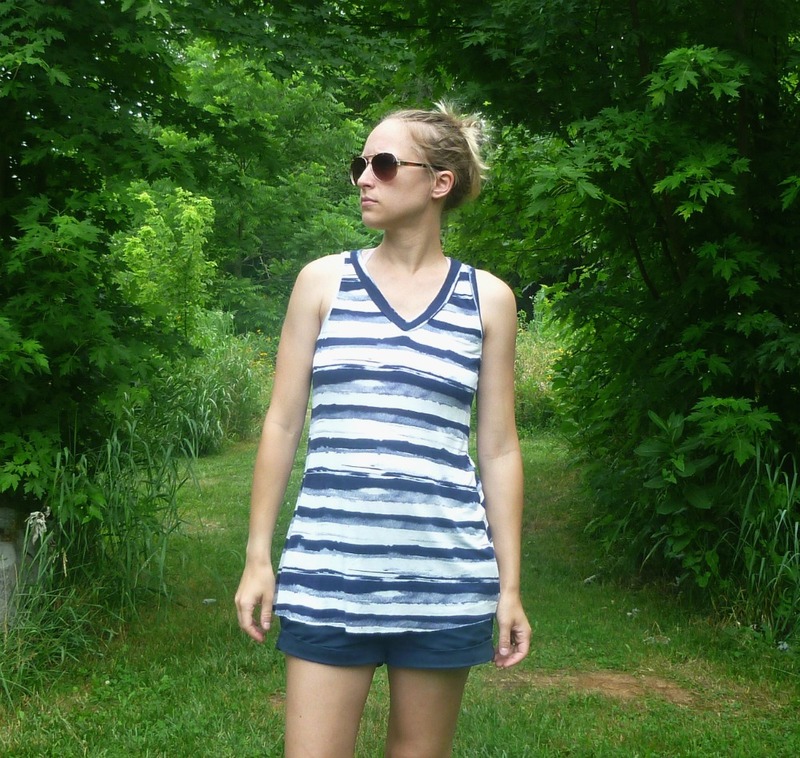 The blue stripe (from Raspberry Creek on Etsy) was used for a Hey June Santa Fe. I was so happy that I had enough yardage left to cut these tanks, because rayon knits are kind of my jam right now. I also like how the shoulders are cut. They're more narrow than my other tank patterns (in fact, I thought I had cut incorrectly at first) and I think it's more feminine and flattering. 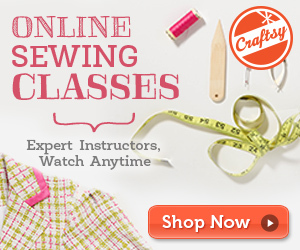 These are a quick cut and sew, especially if you're like me and don't hem! 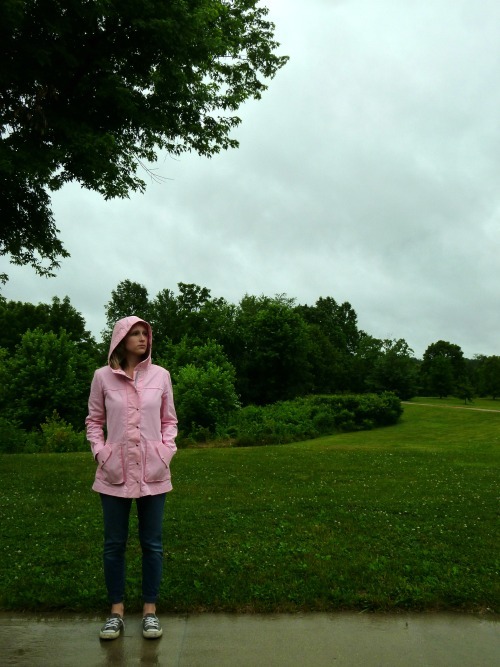 This is my "is it going to rain?" face...and the answer was yes! What tank pattern are you digging right now? Anyone else obsessed with rayon knits like I am? Hi everyone! I'm back from my much-needed vacation and today I'm sharing my travel capsule wardrobe. I am a classic over-packer, but for this trip space was a concern and I HAD to get my packing under control. I turned to Pinterest for help and came across this great guide using the 5-4-3-2-1 system. I started there, but ended up varying from the formula. My favorite thing about this capsule collection is the color scheme. It's mostly black and grey, which meant everything went with everything. For example, I wore the grey sweater dress with my wool leggings the morning we took the boat ride in Niagara Falls. The poncho they provided covered my top half, but my legs were nice and cozy in my leggings and stayed dry. When it warmed up later, I simply removed the leggings and still had a complete outfit. 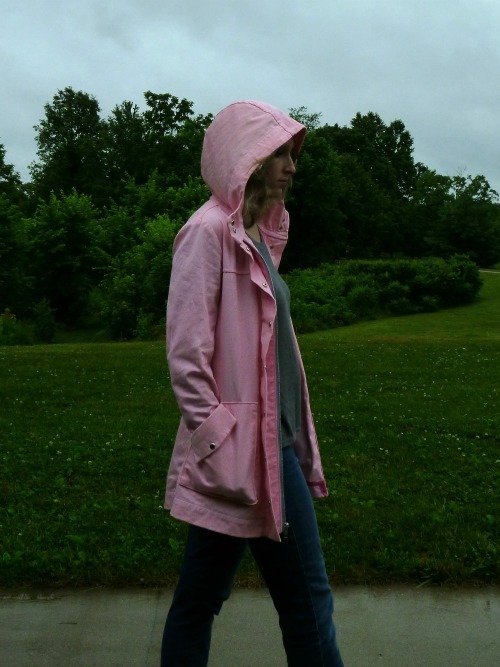 If it had been cool or rainy I could have thrown on my Kelly Anorak, my only piece with significant color. The shorts, leggings, and one pair of jeans I brought were all black, and with one exception all my tshirts were grey with black accents. Toss the grey cardigan on top for cool mornings, and the textured of the cardigan still worked with the whole outfit without making me into a grey blob. If I had needed them, the navy jeans would have worked with any top. I also kept my accessories in the black/grey family, although it was warm enough that I didn't need a scarf or armwoolies. Even my shoes were black and grey! My aviator glasses were casual and went with everything. 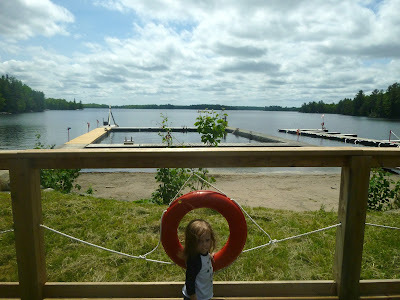 We had a great trip, in no small part because I never had to worry about what to wear. Sometimes fewer choices can be freeing. The kids had one outfit for each day, bagged in a Ziploc and labeled with the day. They were actually excited to get up and ask for their "Friday" or "Saturday" bags! Much more excited than when I offer their entire closet and ask what they want. On this trip, I learned that less is more, and that you don't have to do anything fancy as long as you love the people who go along for the ride. 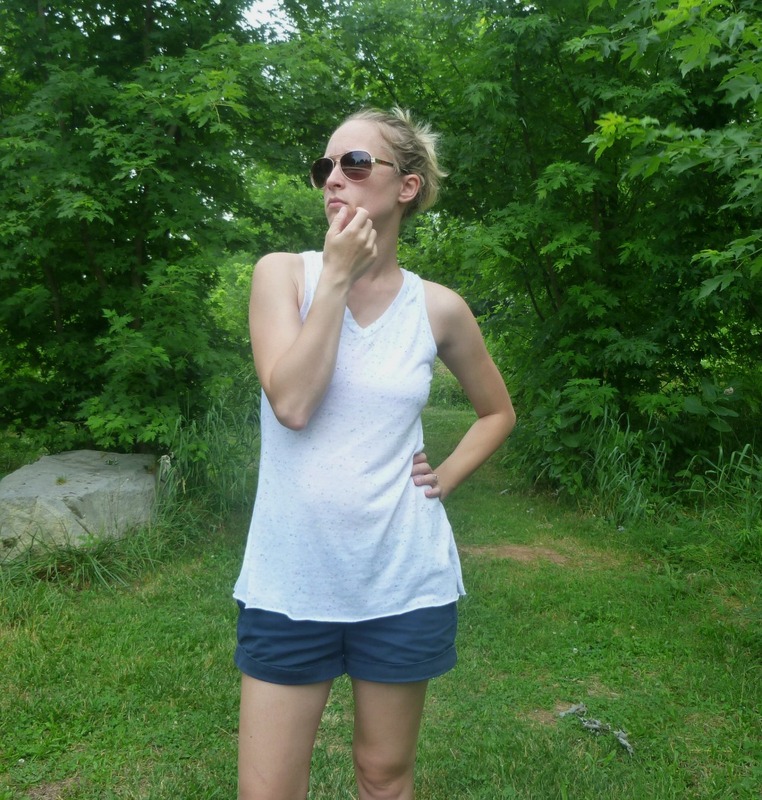 Have you tried capsule wardrobes for travel? 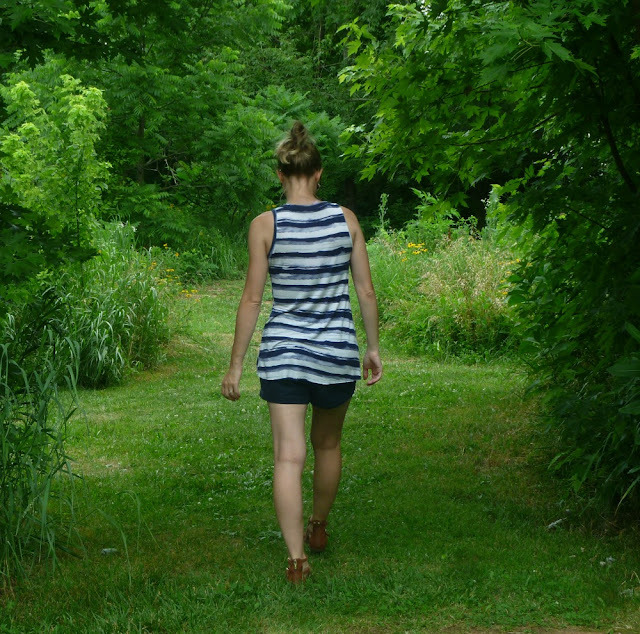 This was a great way to get my feet wet with the idea of capsule wardrobes. I'm currently reading The Curated Closet and can't wait to pare down my whole wardrobe to things I love. 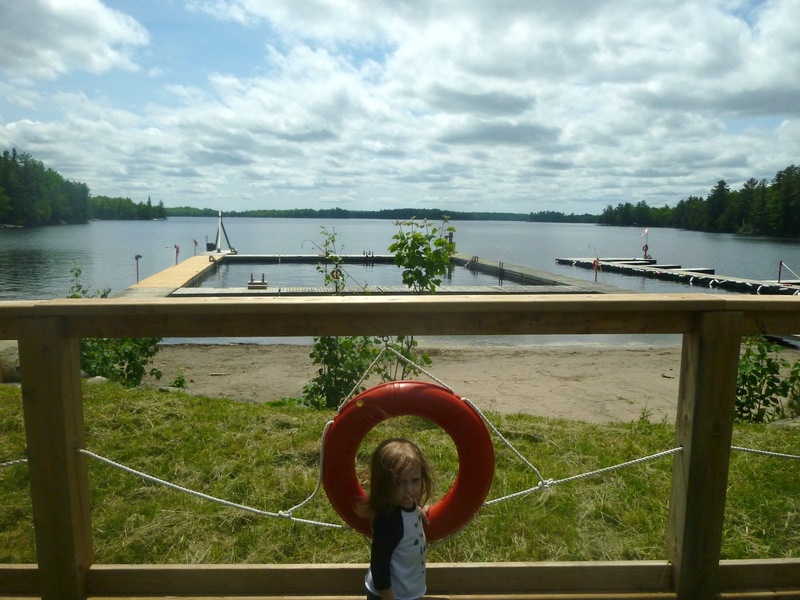 I've mentioned my upcoming vacation a couple times, and today I'm sharing a last-minute project perfect for summer trips! I spent weeks constructing my own Portside Duffle, only to realize that my kids don't have anything similar. Since adding a third child into the mix, we've only done a single overnight away from home. Our vacation will be nearly a week, which meant each child needed a bag of her own. No way it was all going to fit into my bag! I searched Pinterest for a free, quick pattern and ended up finding a tutorial here. Cheap was the name of the game, so I used as much stash material as possible. I found that the tutorial was a little off in fabric estimation, a full yard of 44" wide fabric is what I needed. So far I only have one bag done, the other two are a few steps away from completion. I used zippers from my stash which appear to be separating sport zippers. Two of them are longer than the tutorial stated, but there are directions for making adjustments. The only thing I purchased was the webbing, from Jo-Ann's. These bags are highly unstructured and do not contain interfacing. There is a facing for the zipper but no lining. They're basically only going to hold clothing and a toothbrush, perhaps an extra pair of shoes, so I didn't need anything heavy duty. The bags are a pretty quick sew, the longest step was figuring out how to cut out the circles for the ends (hint, I found a plate)!